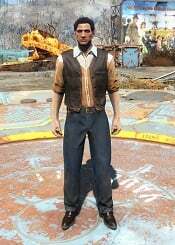 Orange Shirt Western Outfit is an Outfit in Fallout 76. These are items equipped cosmetically by the player "on top" of their armor. This feature is unique to this fallout game, and is meant to promote individuality and provide freedom for players to express themselves and role-play their characters.